On 26 February 2013, it was announced that Lord Hodge will succeed Lord Hope (who is retiring in June) as one of the two Scottish Justices in the Supreme Court. He will commence his appointment at the beginning of the next court year, in October 2013. Patrick Stewart Hodge was born on 19 May 1953. He studied at Corpus ChristiCollege, University of Cambridge and then obtained his LLB from the University of Edinburgh. Lord Hodge has enjoyed a busy and varied legal career. His time in legal practice has seen him focus on commercial law, judicial review and property law, and his work has spanned several industry sectors. His legal career began in 1981, when he was appointed as junior counsel to the Department of Energy. Lord Hodge was admitted to the Faculty of Advocates in 1983 and in 1991, after leaving the Department of Energy, he joined the then Inland Revenue. His time at the Revenue lasted until 1996 when he was made a QC. Lord Hodge was a part-time Law Commissioner from 1997 to 2003. From 2000 he served as a judge in the Court of Appeal of Jersey and Guernsey and was the Procurator of the General Assembly of the Church of Scotland. 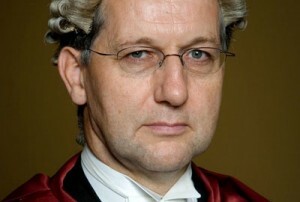 He continued in these roles until his appointment in 2005 as a judge in the Scottish Judiciary. His role within the Scottish Judiciary saw Lord Hodge being an Exchequer judge in the Court of Session where he listened to predominantly commercial cases. However, he is also well known for being an intellectual property judge and sitting in the Lands Valuation Appeal Court. In 2011 he was appointed an Honorary Bencher of Middle Temple, a position he still holds. Upon his appointment to the Supreme Court, Lord Hodge stated “I am honoured to have the opportunity to serve as a member of the Supreme Court. I look forward to working with my colleagues from the three jurisdictions of the United Kingdom“. Lord Hodge married his wife, Penelope Jane Wigin, in 1983 and they have two sons and one daughter. Lord Hodge enjoys the opera, skiing and playing golf: he is a member of the Bruntsfield Links Golfing Society. Additionally, he is a trustee for the David Hume Institute, which aims at promoting informed debate on public policy and has been a Governor of Merchiston Castle School, Edinburgh since 1998. Do you provide Summer intensive short courses in your University in Intellectual PropertyRights and Copyright Protection Laws for Artists when exhibiting their Artworks in An Art Museum? Dear Dr Badran – this is a profile of Lord Hodge, not a means of contacting him. Leave a reply on "Profiles: Lord Hodge"